Here is something so sweet and yummy that I doubt that anyone could turn away from it! We have been enjoying fresh, ripe, juicy, organic Red Haven Peaches, grown in the Okanagan. I have been on Pinterest a little too much and saw some "inspiring" pins about such things as chocolate-covered apricots and such, and of course, you know, one thing led to another, and there I was, dehydrating these amazing peach slices (took almost a day-- well-washed, skin still intact, sliced, rinsed in lemon juice, and sprinkled with Cinnamon) and thinking about what Bill from OK Fruit had said when he delivered them "Just dehydrate them halfway and then they are like those little candies that are crispy on the outside and then have this delicious flow of liquid in the middle"... and I thought of the image of the chocolate-covered apricots, and the two images came together like, apparently, the famous teaming of chocolate and peanut butter for Reese's Pieces. 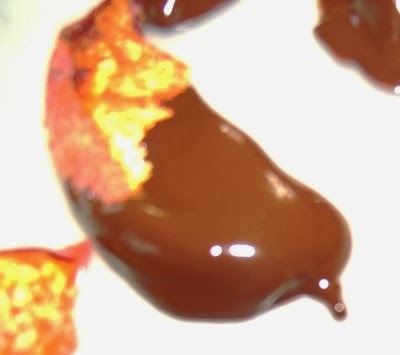 I love chocolate-dipped strawberries-- but nothing beats these luscious dried peaches dipped in yummy melted chocolate (I used "Enjoy Life" Mini Chips, certified Gluten-free). I just put a small bowl of the Mini Chips (maybe 1/2 a cup) into a larger bowl of hot water and then stirred them when they began to melt. Then I stuck the pan of dipped peaches into the freezer for a few minutes to harden. Easy Peasey. If you want to check out my other dehydrated vegan treats on Pinterest, go to http://www.pinterest.com/healthiacynthia/dehydrated-vegan-recipes/ Feel free to follow me and I'll follow you back!